When Babaji sent Master to the United States all those years ago, he sent him to help us remember the ember of joy that we all have nestled quietly in our hearts. He sent him so we could remember how to live our lives in joy, how to bring joy into our everyday lives. How to garden with joy, how to cook with joy, how to sit in front of a computer with joy, how to sit in traffic with joy. Swamiji founded Ananda in order to give us a place where we could live amongst friends, like-minded souls, and practice our spirituality on a day-to-day basis. He’s encouraged us to be practical in our spirituality, given us examples of how to live a perfectly normal Western life, but one infused with joy, which makes it extraordinary. This is what Babaji had in mind when he sent Master to the West. At Ananda Palo Alto, we’ve created a beautiful mandir, a beautiful courtyard there, beautiful gardens here, beautiful edible gardens, and we’ve brought beauty and practicality into our homes. We’ve surrounded ourselves with beauty and simplicity, and that has brightened those soft embers of joy. Master’s Kitchen is the heart of our community. It’s one of the main places where we come to be together, simply, joyfully. All day Saturday and Sunday in the midst of all the cooking and decorating, people wandered in and chatted. Some stayed for a while and then left and went about their busy days. Amy came and snipped mint leaves and coaxed pomegranate seeds out of their leathery cases. Chidambar and Dambara came and whittled away at Amara’s Cinderella pumpkin, then Joey came and someone handed him a knife, and together they turned Cinderella’s coach into 3 cm cubes, chatting and laughing together, this joyful blending of generations. Marilyn came and helped shave tiny flowerets off a sprawling landscape of cauliflower. Camella took our brimming bowls and transformed each morsel into delectable magic, every mouthful infused with our joy, with Joey’s and Chidambar’s and Amy’s. Uma Devi and D’Arcy threaded their way in and out, washing towels, emptying garbage cans, draping saris, decorating tables, creating this exotic haven. Everything was bubbling with quiet joy. Zana dropped by and we asked, “Hey! 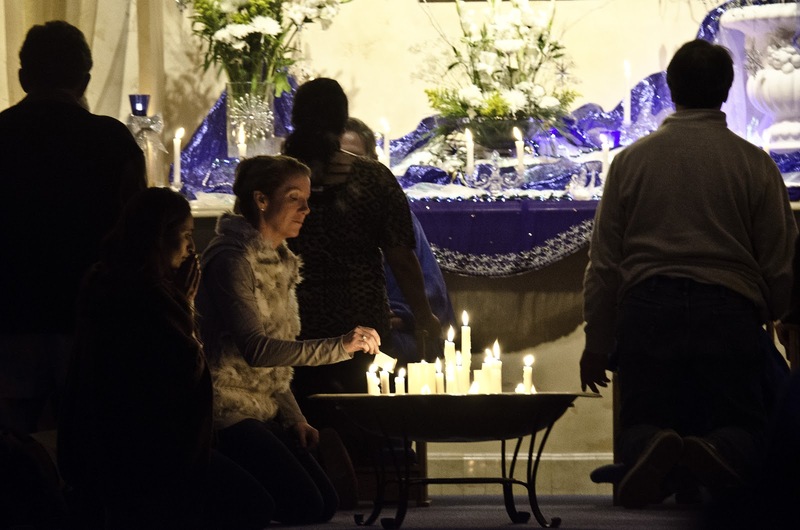 Do you want to be a server?” and she said, “YES!” Rosalva said, “That sounds like fun.” We turned to Joey, and he nodded and said, “Okay.” And there he was Sunday night serving alongside everyone else, his heart so full of beauty that it makes one weep. This is what Babaji had in mind. On Sunday we boiled dried peas in an ancient tradition, added spices and roots, ladled it into bowls, drizzled it with walnut oil, sprinkling it with cilantro. 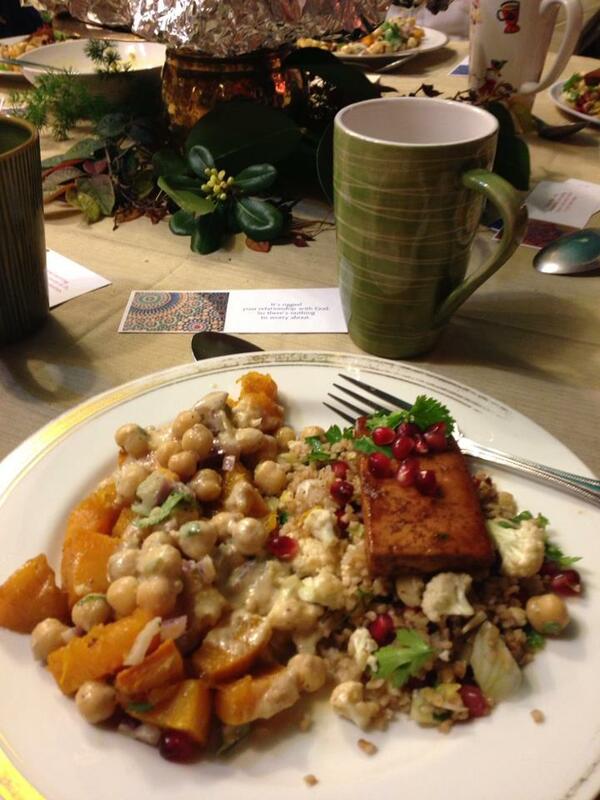 We painted tofu with rich pomegranate molasses, thick with cinnamon and garlic, then baked it and perched it atop a dazzling winter tabbouleh. We roasted the pumpkin in garlic and allspice, tossed it with chickpeas and red onions, added a splash of tahini and sent it out to the waiting crowd. We simmered Medjool dates in espresso and cinnamon, nestled them against a scoop of thick yogurt. Next to the dates we spread orange slices sprinkled with dried rose petals and pomegranate seeds. Not to be outshone, a wedge of pistachio and almond tart, sprinkled with orange zest and crunched pistachio, completed the dessert plates. . . everything, everything, infused with our joy. This is what Babaji had in mind. The “House Husbands” buddied up to entertain us, sharing their homemaking tips, fueled by power tools galore. D’Arcy danced an ancient spiritual dance, which was received with cheers and riotous applause. Throughout the evening diners chatted and laughed, receiving all that joy, making it their own, taking it home and tucking it under their pillows while they slept, sharing it with everyone they meet, the next day and the next day, and the next. This is what Babaji had in mind. This community, that room, that meal, that moment, and the next and the next and the next. We transform the rooms around us to reflect the joy that we feel in our hearts as we go about our day-to-day lives. We transformed the school, and the mandir, the courtyard, our temple here, Chela Bhavan, the gardens, and now we come to Master’s Kitchen. Our stoves have been loyally hanging on by a thread, heating their little hearts out, waiting until that moment, when we come together, share our joy, and create the energy to transform Master’s Kitchen into the visibly beautiful heart of our community, reflecting what it already is in spirit. We have started moving that spirit of joy into visible beauty and efficiency. We didn’t do it all Sunday night, but we have started, taking the first step, and taking it with joy, because that is what Babaji had in mind. 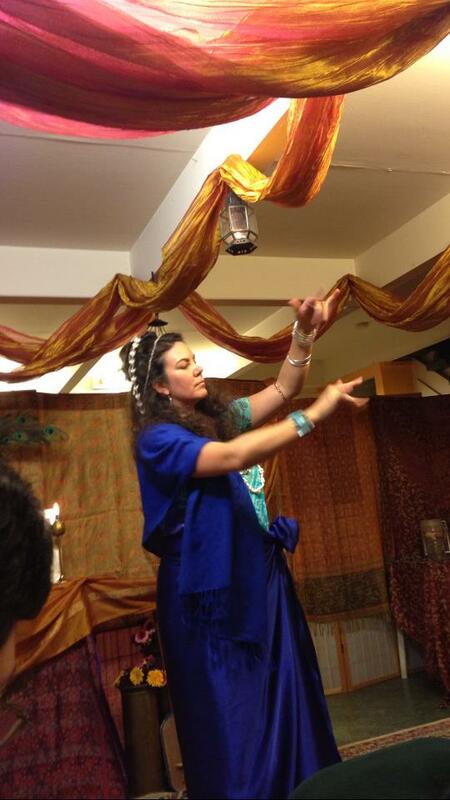 Our New Year’s Eve service this (well, last) year started with a meditation and two sets of initiations. 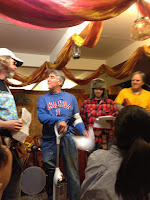 We welcomed Arthur, Amy, Debórah, and Ken as Pilgrims, and Biraj and Lahari as Nayaswamis. The Nayaswami initiation includes a fire ceremony, symbolically offering the ego up to God, and also making a nice prelude to the latter part of the service. Some of you may remember our service a year ago, which turned out to be rather more exciting than expected due to a fire ceremony that developed into a blazing pool of wax. You will be relieved (or, in Asha’s case, disappointed) to hear that we have since developed what Master might coyly call “certain yogic techniques” to avoid conflagration, including fewer candles, and extra metal bowls to catch the burning paper. And so we were all able safely to offer our New Year’s resolutions and prayers into the fire of Divine Light. New Year’s Eve service wraps up relatively early around here (after all, to paraphrase the Bhagavad Gita, what is 9pm to the worldly man is midnight to the yogi), but it’s not the end of our New Year festivities. 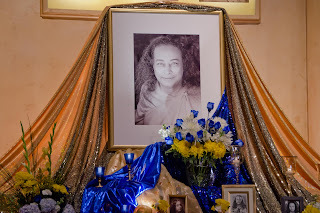 On January 5th we celebrated Yogananda’s birthday, and by extension, the spiritual birthday of each one of us. In honor of the day we each had a chance to affirm or renew our commitment to the spiritual path, at whatever stage we’ve reached. The renewals even included a few new initiations: Judy as a Sadhaka, and Liz and D’Arcy as Sevakas. We didn’t manage any photos of the evening, or of the lovely altar, but here’s one from last year, and Master hardly seems to have aged a day since then.